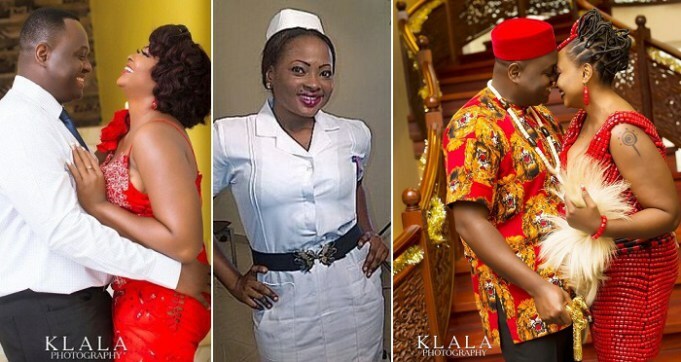 “I regret not marrying earlier, marriage is sweet” – Actress, Nkechi Emmanuel ‘Nurse Titi’. HomeAll“I regret not marrying earlier, marriage is sweet” – Actress, Nkechi Emmanuel ‘Nurse Titi’. Nollywood actress, Nkechi Emmanuel, who came to limelight after her role in popular sitcom ‘Clinic Matters’ as ‘Nurse Titi‘, has in a new interview recounted how the journey into marriage has been so far, just after tying the nuptial knot with her husband, Ambrose Amara in December 2017. She says she’s enjoying every bit of marriage and she only regrets that she didn’t go into it early enough. She said this in an interview with Goldenpearlmedia. ‘Marriage feels so good. In fact, I regret why I didn’t go into it early enough. It’s so sweet. I will advice all single ladies and guys out there to try find the right person as a life partner. There is nothing like having the right person who your heart beats for, all the time. Hugs in the morning and night, then sharing ideas and everything together. Honestly, I still regret why I got married late. I should have done this a long time ago’. “Not at all. I don’t see it coming. It’s even going to multiply my progress, because hopefully most of the movies he’s going to be directing, I will be involved. So. it’s going to boost my career”. In a previous interview, the actress shared how she met her husband, who according to her, was searching for actresses for a movie project. ‘We met through work. He spoke to a friend of his (who is an actor) in America that he wants to come and shoot a movie in Nigeria and that he needs some good actresses. He explained to the friend (who happens to be my friend as well) that he’s been searching but haven’t found the kind of quality he wants. And so he (our mutual friend) recommended me to him. So we got talking on a professional level, exchanged mails and pictures and gradually one thing led to the other… and we had our traditional wedding and court wedding’ she said.